Objective: To evaluate markers of axonal damage in CSF and serum of patients with different subtypes of MS in relation to measures of disease progression on MRI. Methods: In 51 patients with MS (21 relapsing-remitting, 20 secondary progressive, 10 primary progressive), levels of heavy and light neurofilaments (NfH and NfL) and antibodies to neurofilaments (anti-NfL and -NfH) as well as the total immunoglobulin G (IgG) were analyzed. MRI analysis included T2 hyperintense, T1 hypointense, and gadolinium enhancing lesions and markers of cerebral atrophy (ventricular and parenchymal fractions). Results: For the total group, correlations were found between the anti-NfL index and the parenchymal fraction (PF) (r = −0.51, p < 0.001), T2 lesion load (r = 0.41, p < 0.05), ventricular fraction (r = 0.37, p < 0.05), and T1 lesion load (r = 0.37, p < 0.05). For the anti-NfH index, a correlation was found with the PF (r = −0.39, p < 0.05). No correlations were found between the IgG index and MRI measures. Conclusions: Intrathecal production of anti-NfL antibodies may serve as a marker of tissue damage, particularly axonal loss, in MS. Although MRI has the potential to identify atrophy and different types of lesions, it lacks pathologic specificity. CSF analysis, however, may add greater pathologic specificity as it provides information from the body fluid that is most closely associated to the disease process. It has been suggested that intrathecal levels of axonal cytoskeletal proteins may be reliable markers of axonal damage. The purpose of this study was to determine levels of NfL and NfH and their respective antibodies in matched CSF and serum samples from patients with different clinical subtypes of MS and to evaluate their relation to MRI measures of tissue damage. The group consisted of 28 women and 23 men with a mean age at the time of the test of 44.5 years with an interquartile range (IQR) of 38.1 to 51.2. The median disease duration, calculated as the time lapse between the onset of neurologic symptoms and the time of testing, was 13.8 years (IQR 7.0 to 23). The median time from the last relapse until the lumbar puncture was 36.5 months (IQR 6.3 to 81.3) (RR and SP patients only). Samples of CSF were obtained by LP and aliquots of CSF were stored at −80 °C. Detailed neurologic examination and MRI scanning was performed within 1 week of the LP. Approval for the study was obtained from the Ethics Committee of the VU Medical Center and written informed consent was obtained from all patients. CSF and serum albumin concentrations were determined by a standard Laurell “rocket” electroimmunoassay. An enzyme-linked immunoassay measured NfH by using 96-well microtiter plates (Maxisorb, Nunc, Denmark). The plates were coated with monoclonal mouse anti-NfH antibodies (SMI 35, Sternberger Monoclonals Inc., Lutherville, MD) in 0.05 M carbonate buffer and incubated overnight. The plates were washed with barbitone buffer containing EDTA, bovine serum albumin (BSA), and polyoxyethylenesorbitan monolaurate (Tween 20, Sigma, Poole, UK). After blocking and washing the plates were incubated with diluted CSF for 1 hour and washed. Then the second antibody was added (rabbit polyclonal anti-NfH, Sigma) and incubated for 1 hour at room temperature and washed. Finally, horseradish peroxidase–conjugated polyclonal swine antirabbit immunoglobulin G (IgG) antibody was added for 1 hour and washed. TMB (Dako, Carpinteria, CA, one-step substrate) was used as color substrate. The color reaction was stopped with hydrochloric acid and the absorbance read at 450 nm referenced against 750 nm. All samples were processed in duplicate. The antigen concentration was calculated from a standard curve (range 0 to 5 ng/mL) using bovine NfH (Affiniti Research Products, Exter, UK). High and low quality controls were run with each plate. The coefficient of variation for 2 ng/mL was 5.6% and for 0.2 ng/mL 19.8%. The same method as for NfH was used to determine NfL with the first antibody being a monoclonal anti-Nf 68 (Sigma). The second antibody used was the rabbit polyclonal anti-NfL (Affiniti Research Products). A sensitive, captured ELISA was used to measure anti-NfL and anti-NfH IgG antibodies in CSF and serum.15 In brief, ELISA plates were coated with 50 μL of a solution of purified 68-Kd (BL 62008) or 200-Kd (CBL 62010) bovine neurofilament (Cymbus Biotechnology, UK; 2.5 μg/mL) in bicarbonate coating buffer (pH 9.6) at 4 °C overnight. The plates were blocked with 1% BSA in phosphate buffered saline (BSA/PBS) and then coated with CSF or serum samples (50 μL/well) for 2 hours at 37 °C. Samples were analyzed in duplicate; CSF undiluted and serum diluted 1/400 in 1% BSA/PBS. Bound antibody was detected with an antibody to human IgG (γ-chain specific) conjugated to alkaline phosphatase (Sigma, A-3150) for 1 hour, washed, and then optical densities (OD) measured after color development with p-nitrophenyl phosphate. In developing each assay, we utilized a pool of human sera previously demonstrated to have high titers of anti-Nf and anti-axonal IgG. Serial dilutions of the pooled sera were run in each test to generate a standard curve and to ensure consistency of the assay. For the anti-NfL, the mean between-test coefficient of variation (CV) of the standard curve was 18.9% and for anti-NfH 17.0%. In the anti-NfL assays, the overall mean CV of all serum and CSF specimens were 7.0% and 8.7%, and in the NfH assays 6.1 and 8.5%. The sensitivity of the assays, determined by the lowest dilution of the standard curve with an OD consistently higher than the mean plus three SD of wells filled with just BSA, was 1/3,200 for the anti-NfL and 1/6,400 for the anti-NfH assays. In order to distinguish intrathecal and systemic production of anti-Nf IgG, an anti-NfL index and anti-NfH index were calculated similar to the calculation of the IgG index18 using the following formula: (CSF units/serum units)/(CSF albumin/serum albumin). Total IgG was measured in CSF and serum samples by a two-site immunoenzymetric assay (Cygnus Technologies, Wrentham, MA). The IgG index was calculated as mentioned previously. Two ratios were calculated: 1) the parenchymal fraction (PF), defined as whole brain parenchyma/intracranial volume; and 2) the ventricular fraction (VF), defined as ventricular volume/whole brain parenchyma. The total volume of hyperintense lesions seen on the T2 images and of gadolinium-enhancing lesions and hypointense lesions seen on T1-weighted images were calculated. The MRI raters were trained in measuring lesion loads and volumes, with a CV of less than 3%. In two subjects no adequate MRI data could be obtained. Technicians blinded to the results of other analyses performed MRI analysis. The researchers who performed the tests on the samples were blinded for the clinical and MRI data. Data analysis was performed with the SPSS software package (version 9.0 for Windows; SPSS, Chicago, IL). Data were checked to see whether their distribution was normal and nonparametric statistics used when normality was rejected. All correlations were studied using Spearman rank correlation coefficient (r) for nonparametric testing of data. The correlations were analyzed in the patients with MS as a whole group, in the separate MS subtypes, and in subgroups defined by the presence or absence of relapses in the last 2 years. Differences between groups were compared by one-way analysis of variance, Wilcoxon test, or Kruskal-Wallis test as appropriate. A 5% level of significance was used throughout. The clinical characteristics of the subjects in the different diagnostic groups are shown in table 1. As expected, significant differences were observed between RR and SP with respect to age, disease duration, EDSS, and time since last relapse. Significant differences between SP and PP subjects could be shown with respect to the EDSS. The MRI characteristics are summarized in table 2; no significant differences could be shown between the subgroups. Results of the CSF assays are shown in table 3. No significant differences were found between the RR, SP, and PP groups for the IgG indices, levels of CSF NfH, or anti-NfL and anti-NfH indices. NfL protein was below the detection limit of the test in all CSF samples. CSF IgG correlated with CSF anti-NfL (r = 0.51, p < 0.01) and CSF anti-NfH (r = 0.41, p < 0.05). The IgG index correlated only with the anti-NfH index (r = 0.43, p < 0.05) but not with the anti-NfL index. The anti-NfH index correlated highly with the anti-NfL index (r = 0.73, p < 0.001). There was no correlation between CSF NfH and either the anti-NfH index or CSF anti-NfH. Correlations between CSF and demographics. In the group as a whole, there were no significant correlations observed between the CSF Nf, the anti-Nf, or IgG indices and EDSS score, subject age, or disease duration. Correlations between laboratory and MRI measures. In the group as a whole there were correlations between the anti-NfL index and the PF (r = −0.51, p < 0.001), the T1 lesion load (r = 0.37, p < 0.05), the T2 lesion load (r = 0.41, p < 0.05), and the VF (r = 0.37, p < 0.05) (figure). For the anti-NfH index there was only a correlation with the PF (r = −0.39, p < 0.05). There were no correlations between any MRI measures and either the IgG index or CSF NfH. Figure. 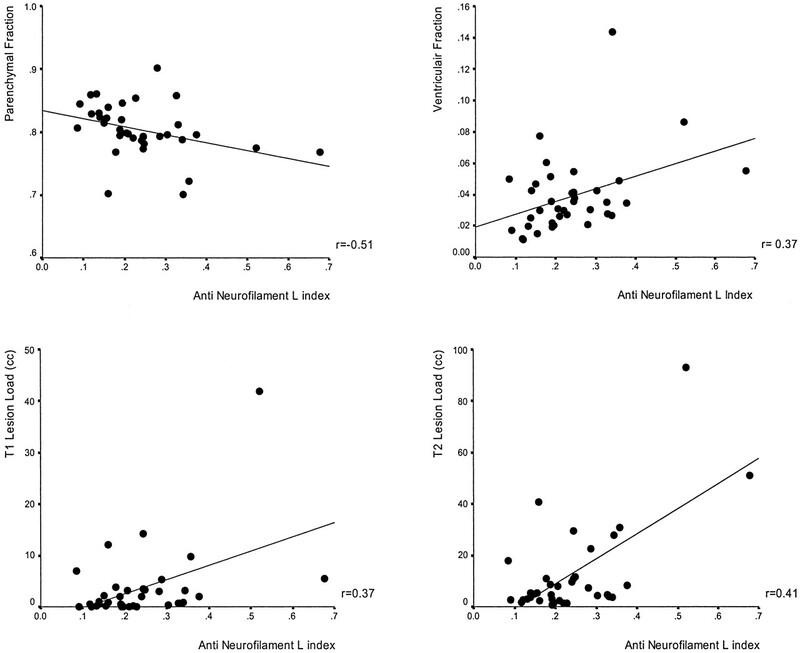 Correlations between the anti-neurofilament-L index and four MRI measures. When testing the subgroups separately we found that correlations were mainly found in the RR subgroup: the anti-NfL index correlated with the PF, VF, and T1LL (r = −0.56, p < 0.05; r = 0.72, p < 0.01; and r = 0.61, p < 0.05). No significant correlations were found between the CSF proteins or antibodies and MRI measures in the SP and PP groups. The current study indicates that there is a significant correlation between intrathecal production of IgG antibodies against NfL and MRI markers of inflammation and tissue destruction in MS. The strongest correlation was for the PF, one of the two atrophy measures analyzed in this study. In previous studies levels of neurofilaments or their antibodies have been correlated with clinical measures of disease severity, whereas in this study we used MRI. MRI measures are more precise, objective, and sensitive to change and may give a more accurate relation to the underlying pathologic processes. The most likely explanation for these differences lies in the selection of study subjects. In the earlier study CSF was collected when LP were performed as diagnostic procedures. In the RR subjects this was usually related to a relapse or soon thereafter and in the progressive groups the indication for CSF analysis was usually a recent deterioration in clinical condition. In the PP subjects this was often when disability was becoming more apparent and in the SP subjects at the transition between a RR course and disease progression (a median of about 12 years). It has been suggested that during this transitional phase of early disease progression there is a process of matrix destruction. If this were the case, it is likely that axons would be exposed, thereby augmenting a humoral response to these proteins. In contrast, in the current combined study, the subjects were volunteers and were more likely to have had a stable course in the preceding months. The duration of symptoms was considerably longer in both the SP and PP groups than in the initial series and in the majority there was a long lapse between CSF sampling and the last relapse, with a median of 77 months in the SP group. It is thus likely that the disease was more quiescent in subjects in this series with less ongoing matrix destruction. The current study is consistent with the previous one in that there seems to be some degree of selectivity in the humoral response: correlations of MRI measures with the anti-NfH index were weaker and a correlation with the IgG index was absent. Even though our findings strongly suggest that antibodies to NfL are produced during the course of the disease in relation to ongoing tissue damage, our data give no answer to the question of whether these antibodies have a pathogenic role in relation to axonal damage or rather are phenomena secondary to release of increased amounts of axonal proteins. Although our assay to measure CSF NfL was similar to that used by others,12 we were not able to detect NfL in CSF. Similarly, colleagues working independently were able to detect CSF NfL in low levels with no differences between patients with RR and progressive MS and other neurologic and normal controls.15 Several explanations are possible. First, NfL levels in our patients were low, as NfL may be released mainly during relapses, but returns to baseline levels within 2 months.12 Second, NfL is prone to protease digestion, whereas phosphorylation protects NfH.26 Next, as pointed out recently,13 the assay may not be sensitive enough. Finally, anti-NfL antibodies may bind with high affinity to the released NfL, thereby preventing detection in the assay. Traditionally, MRI–pathology correlates can only be studied on biopsy specimens (which by definition have been obtained from patients who have atypical presentation and therefore might not represent typical findings of MS) or on autopsy tissue. We propose that our study, correlating MRI measures to specific biologic markers, provides an in vivo MRI–pathology correlation that has the important advantage that it can be longitudinally validated. In view of the growing understanding of the contribution that axonal damage makes to clinical disability and the belief that therapeutic intervention should begin early in the disease course to diminish disability, both MRI and CSF markers of axonal destruction in MS are of great potential clinical relevance. If proven to be real surrogates, either alone or in combination, they may assist clinicians in guiding therapeutic decisions by identifying patients at risk for developing a rapidly progressive disease course. Supported by a grant from The Friends of MS Research (MS 97-310), The Multiple Sclerosis Society of Great Britain and Northern Ireland MS Society, and the Special Trustees of Guy’s and St. Thomas’ Hospital. The authors thank the study subjects and Herman Adèr for statistical advice in the data analysis. Martin R, McFarland HF. Immunological aspects of experimental allergic encephalomyelitis and multiple sclerosis. Crit Rev Clin Lab Sci . 1995; 32: 121–182. Ebers GC. The natural history of multiple sclerosis. Neurol Sci . 2000; 21: S815–S817. Lee MA, Smith S, Palace J, et al. Spatial mapping of T2 and gadolinium-enhancing T1 lesion volumes in multiple sclerosis: evidence for distinct mechanisms of lesion genesis? Brain . 1999; 122: 1261–1270. Brex PA, Parker GJ, Leary SM, et al. Lesion heterogeneity in multiple sclerosis: a study of the relations between appearances on T1 weighted images, T1 relaxation times, and metabolite concentrations. J Neurol Neurosurg Psychiatry . 2000; 68: 627–632. Lucchinetti C, Bruck W, Parisi J, et al. Heterogeneity of multiple sclerosis lesions: implications for the pathogenesis of demyelination. Ann Neurol . 2000; 47: 707–717. Trapp BD, Peterson J, Ransohoff RM, et al. Axonal transection in the lesions of multiple sclerosis. N Engl J Med . 1998; 338: 278–285. van Walderveen MA, Kamphorst W, Scheltens P, et al. Histopathologic correlate of hypointense lesions on T1-weighted spin-echo MRI in multiple sclerosis. Neurology . 1998; 50: 1282–1288. Losseff NA, Wang L, Lai HM, et al. Progressive cerebral atrophy in multiple sclerosis. A serial MRI study. Brain . 1996; 119: 2009–2019. Davie CA, Barker GJ, Webb S, et al. Persistent functional deficit in multiple sclerosis and autosomal dominant cerebellar ataxia is associated with axon loss. Brain . 1995; 118: 1583–1592. Losseff NA, Webb SL, O’Riordan JI, et al. Spinal cord atrophy and disability in multiple sclerosis. A new reproducible and sensitive MRI method with potential to monitor disease progression. Brain . 1996; 119: 701–708. Fuchs E, Cleveland DW. A structural scaffolding of intermediate filaments in health and disease. Science . 1998; 279: 514–519. Lycke JN, Karlsson JE, Anderson O, Rosengren LE. Neurofilament in cerebrospinal fluid: a potential marker of activity in multiple sclerosis. J Neurol Neurosurg Psychiatry . 1998; 64: 402–404. Semra YK, Seidi OA, Sharief MK. Heightened intrathecal release of axonal cytoskeletal proteins in multiple sclerosis is associated with progressive disease and clinical disability. J Neuroimmunol . 2002; 122: 132–139. Tullberg M, Rosengren L, Blomsterwall E, et al. CSF neurofilament and glial fibrillary acidic protein in normal pressure hydrocephalus. Neurology . 1998; 50: 1122–1127. Silber E, Semra YK, Gregson NA, Sharief MK. Patients with progressive multiple sclerosis have elevated antibodies to neurofilament subunit. Neurology . 2002; 58: 1372–1381. Lublin FD, Reingold SC. Defining the clinical course of multiple sclerosis: results of an international survey. National Multiple Sclerosis Society (USA) Advisory Committee on Clinical Trials of New Agents in Multiple Sclerosis. Neurology . 1996; 46: 907–911. Keir G, Tasdemir N, Thompson EJ. Cerebrospinal fluid ferritin in brain necrosis: evidence for local synthesis. Clin Chem Acta . 1993; 216: 153–166. Kalkers NF, Bergers E, Castelijns JA, et al. Optimizing the association between disability and biological markers in MS. Neurology . 2001; 57: 1253–1258. van Walderveen MA, Barkhof F, Pouwels PJ, van Schijndel RA, Polman CH, Castelijns JA. Neuronal damage in T1-hypointense multiple sclerosis lesions demonstrated in vivo using proton magnetic resonance spectroscopy. Ann Neurol . 1999; 46: 79–87. Fu L, Wolfson C, Worsley KJ, et al. Statistics for investigation of multimodal MR imaging data and an application to multiple sclerosis patients. NMR Biomed . 1996; 9: 339–346. Tedeschi G, Bonavita S, McFarland HF, Richert N, Duyn JH, Frank JA. Proton MR spectroscopic imaging in multiple sclerosis. Neuroradiology . 2002; 44: 37–42. Chard DT, Griffin CM, Parker GJ, Kapoor R, Thompson AJ, Miller DH. Brain atrophy in clinically early relapsing-remitting multiple sclerosis. Brain . 2002; 125: 327–337. Kalkers NF, Ameziane N, Bot JCJ, Minneboo A, Polman CH, Barkhof F. Longitudinal brain volume measurement in MS: rate of brain atrophy is independent of subtype of disease. Arch Neurol . 2002; 59: 1572–1576. Bjartmar C, Kidd G, Ransohoff RM. A real-time insight into disease progression and the role of axonal injury in multiple sclerosis. Arch Neurol . 2001; 58: 37–39. Goldstein ME, Sternberger NH, Sternberger LA. Phosphorylation protects neurofilaments against proteolysis. J Neuroimmunol . 1987; 14: 149–160.